On November first I posted on Facebook that I was starting to listen to Christmas music. That post had mixed reviews. Some people were all YAY! for you and some people were all NO! never before Thanksgiving. And I’m good with either because mostly I don’t care what anyone else is doing when it comes to Christmas music, I just know when it’s right for me to start. Truthfully, some years this happens on November 1st and some years it’s later, it all depends on how I’m feeling and what’s going on. Last year, for instance, when November 1st rolled around, Bob had just died and I was sad and Christmas music just didn’t happen until we were well into December. This year, though? This year I was ready and raring to go. I attribute some of this to my late start last year and some of it to election season anxiety – and that, of course, has now turned into post election despair so, truly we need a little Christmas right this very minute. Now. This is me so you know there are rules about early season Christmas music. Some of the mix has to include Thanksgiving music and that, my friends is no easy feat. I do have a couple of versions of We Gather Together and there is, of course, Alice’s Restaurant. And the rest of my Early Christmas Playlist (yes, that’s what I call it) is made up of Christmas music I really love but not necessarily stuff that’s well known or played on the radio. As in, we’re not talking about Jingle Bells. My favorite, and the one I always listen to first, is Fernando Ortega singing Come Thou Long Expected Jesus. And then I go straight to Alan Jackson’s Let It Be Christmas. After that it’s fair game for a bunch of special ones such as All That I Want for Christmas by The Rescues and Darlene Love’s Christmas (Baby Please Come Home) and also All Alone on Christmas. There’s also The Heartache Can Wait by Brandi Carlile and Who Comes This Night by James Taylor. So. That’s the deal with me and the early Christmas jam. How about you? When do you start listening? And what do you listen to first? Believe it or not, Raffi. I love that I’m not the only one listening to holiday tunes! 😀 My collection is vast enough that I need can listen to one different CD each day from Halloween until Epiphany Sunday. It’s my favorite kind of music. My go-to listen is George Winston’s December. That one sneaks into rotation at other times of the year. I see Kwizgiver has excellent musical taste. “Autumn” is my George Winston transitional album. Yes, I’m so old I have the original album. 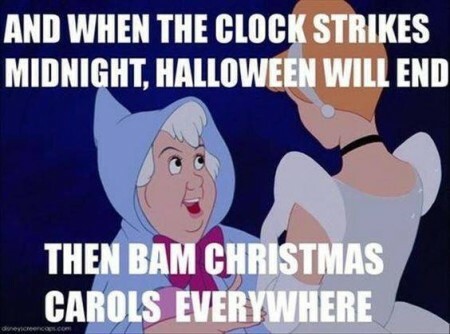 But otherwise, Christmas music doesn’t start until I start preparing food Thanksgiving week. My DH gets overwhelmed by the trappings of the season, so I play it in the car or home alone to give him space for his lower key needs. My Christmas listening doesn’t usually start until well into December, specifically Cookie Day when my sisters-in-law and I get together to bake cookies. It’s almost always instrumental – the Charlie Brown Christmas album, a 6 CD set called Instrumental Christmas, the Chieftains’ Bells of Dublin, and while it’s not music, I usually listen to David Sedaris’ Santaland Diaries a time or two. Thanks for some great new recommendations! Well… guess who’s got me an earworm of the Auntie Mame soundtrack now? ??? Thanks Carole ! I usually start listening to Christmas music in December. It becomes the soundtrack to all of my Christmas activities . . . baking, wrapping, etc. I also usually tune in to one of the Christmas music satellite stations in my car. Too much Christmas music tends to drive Tom a little nuts, though. So I do mix things up throughout the season. ‘Tis the season, to be sure! We always start the weekend after Thanksgiving. A few of my faves are the James Taylor that you mention; the Heritage Christmas (especially their version of “In the Bleak Midwinter”); and, Nancy La Mott’s Christmas album. I’m going to look for some of your faves, thanks for the suggestions. Haven’t started yet, but like others, I listen to George Winston’s “December” year round…as well as his Autumn CD and others by him. “To Drive the Cold Winter Away” and “A Midwinter Night’s Dream” by Loreena McKennitt are both lovely. The week after Thanksgiving I’ll start listening in the car going to and from work. I enjoy a variety of Christmas & winter music and usually begin listening after Thanksgiving. I sing in my church choir and in a choral ensemble at our local university, so right now I am overwhelmed with Advent & Christmas music! I enjoy listening to several Christmas CDs by John Rutter & the Cambridge singers, The Chieftans “Bells of Dublin”, Molly Mason & Jay Ungar “The Pleasures of Winter”, Sting “If on a Winter’s Night”, Charlie Brown’s Christmas, and anything by Bing Crosby or Perry Como. Enjoy! I’ll wait until mid-December and then put it on for wrapping and baking. I start with the Three Tenors Christmas CD that I have and then pretty much Pandora from there. I don’t start listening to Christmas music until about two weeks before the day. But……I do start watching any Christmas movie I can find on tv, including the silly Hallmark movies. Usually I have already seen them in previous years but there are always a couple new ones. Of course there are the classics and I have many on CD. They have proven to be a great distraction during this anxiety-laden election time. Normally, I wait with with the Christmas music until just after Thanksgiving and/or the putting up of the Christmas tree… this year, mainly with the discovery of Leslie Odom Jr’s “Simply Christmas,” it is ON!! I’m not always “into” Christmas, tending to easily fall into Bah Humbuggery, and it’s too early to tell how this season will actually play out, but right now, I am all about the comfort & joy of the holiday season — Thanksgiving to Epiphany. I’m not quite ready and will not willing listen until closer to Christmas. I’m a scrooge. I will, however, get up my twinkle lights soon! The post election dispair has really ramped up for me with the first two staff appointments. So, I feel you, girl! I love We Need a Little Christmas and now you’be got me going crazy to get ahold of that movie and watch it right now! I start anywhere between Thanksgiving and December 1st. I used to start earlier when I was working and driving each day. Helped cheer me up while sitting in traffic! But I’m not in my car that much anymore, now that I’m retired. And when I do go out, most times my husband goes and drives. I’m drawn to Andy Williams and Nat King Cole…. so those are the ones I listen to most. I don’t have a lot of Christmas music – need to get more! I saw a Christmas tree up in someone’s house the other day (through the front window)!! It can be any time of year. I make socks for my son for Christmas, so I’ll sometimes listen while I’m working on them. Heavy duty listening starts sometime in November. Music is still very hard for me, and the new car commercials when everyone is singing makes me cry cause we used to do that all the time when the boys were little. ; actually through middle school too. Since you included Alan Jackson [from just south of Atlanta GA o.0!] have you heard John Berry’s O Holy Night-will give you chills. A local station starts playing Christmas music the week of Thanksgiving, so I usually tune into that, always a nice blend of religious and secular songs. For me Christmas music has to wait until after Thanksgiving, but then I’m all in. I listen to the Messiah a couple of times a week, (it’s a sing along for me. I have been in the chorus for several performances over the years, and I dig out my sheet music & sing along with the altos) the Mormon Tabernacle Choir, George Winston and many more!